Jeremy Bentham's head is in a box. To be precise, it's in Box File 3 at the University College of London Institute of Archaeology. The box is inside a climate-controlled safe meant to protect it from the elements as well those folks who might be tempted to abscond with the head of the father of utilitarian philosophy. 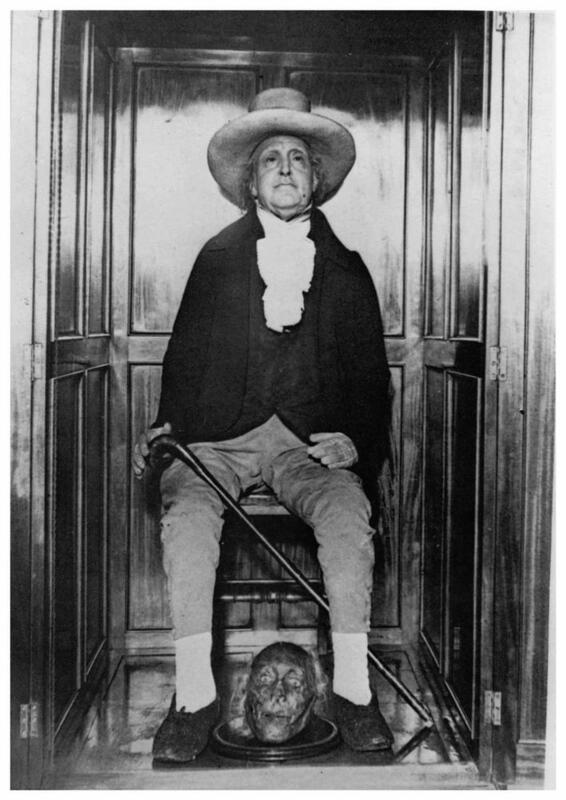 Jeremy Bentham's head wasn't always in a box. In addition to the fact that it rested on his shoulders during his life, it also once sat between the legs of his skeleton -- on the wooden floor of a big, plate-glass fronted cabinet labelled in gold letters: "Jeremy Bentham." That case remains where it has been for over 150 years -- across the street from his head, in a corridor of UCL's South Cloisters. The skeleton is seated, dressed in a simple black suit, and accompanied by Bentham's walking stick. In place of his cranium is a very convincing chapeaued wax likeness. After WWII, the curators decided that Bentham's head was too exposed, again, just sitting on the bottom of the case. So, they decided to build his head its own special box. The problem was, however, that the box was too big to fit between his legs in the case and as a result they moved his head to a plinth nearby. Unfortunately, a human head in a box is just too tempting a target for your standard-issue undergraduate. In 1975, several students nabbed it and held it ransom until the university paid 100 GBP to a shelter. In the end, the university ended up paying only a 10 GBP ransom, and the head was returned. Unverified reports -- probably rooted more in myth than fact -- claim that Bentham's head was once hidden in a train station locker in Aberdeen. Others claim that students used it for a football. In any case, the university decided to put it under lock-and-key in 2005. And that’s why Jeremy Bentham’s head is in a box, in a safe, across the street from the rest of him. The original plan was not to have a wax replica; Bentham's body should have been topped with the head it carried in life. However, his friend, Dr. Thomas Southwood-Smith, tried an experiment in preservation at the postmortem. He suspended the severed head over a bath of sulfuric acid under the dome of an air pump. The idea was to draw out Bentham's bodily fluids, but leave behind a dessicated, but perfectly recognizable, likeness. That's not what happened however, and Bentham’s visage resembles those mummified, leathery faces that are sometimes discovered in bogs. That’s why Bentham’s friends hired the French artist, Jacques Talrich, to create a portrait bust in wax. Of course, all this begs the question: why? Why would Bentham's friends strip the flesh from his bones, dress him up in his everyday attire, sit him on his favorite chair, mummify his head, and put him in a glass case on public display? Before answering this, it's worthwhile to consider another story. In July 1832, a month after the death of Jeremy Bentham, a woman going by the name of Madame Derubigny Barré passed away in Dublin at the age of 72. Across the city, at Trinity College, the Professor of Anatomy, James Macartney (1770-1843) was soon contacted. Madame Barré had bequeathed her body to science, offering the doctor £10 to prepare her skeleton to be displayed in a glass case in his museum. She intended her body to both educate and to provide a model for other women to emulate. Macartney had never met Madame Barré, but he found out from her neighbors that she was active during the French Revolution and imprisoned during the Terror for hiding her father, a suspected Royalist. After successfully defending herself from her accusers, she became a leader in the so-called "Band of Amazons," the Secretary to the "Female Club," and Commissary of prisons. According to Macartney, she was "the first FEMALE who bequethed her body for dissection." As with Bentham's body, who was dissected by Southwood-Smith, Macartney would have worked quickly, weighing and measuring Madame Barré‘s organs, comparing them to other dissections, and searching for unknown biological features. Like Bentham, her skeleton was displayed publicly, along with a number of other curiosities in Macartney’s museum: Cornelius McGrath, "the Irish Giant" and William Clark, "the ossified man." In a display of medical ethics much more disturbing to modern sensibilities than playing kickball with Bentham's desiccated head, Macartney removed a portion of Madame Barré's skin, which in 1834 was described as "tanned quite as good as shoe-leather." Not only did he put her skeleton and skin on display, but he seems to have offered pieces of her skin as a souvenir to select visitors -- taking part in the centuries-long trade in human body parts which ethicists have only begun to critique in the past few decades. One American medical student, J.M. Warren, returned home with a small piece of Madame Barré’s skin, passing it down to descendants until it eventually found its way into the Harvard Medical School collections. Barré's skeleton was deposited in the Cambridge University Anatomical Museum. Bentham and Barré -- two individuals who never met or corresponded as far as we know -- each made a decision that few today and even fewer in their day would make. Social habit had long made human dissection unpalatable for European mores, a situation reinforced by the legal system. In Britain, for example, the Murder Act of 1752 stipulated that dissection was one of two punishments reserved for murderers. After the execution, judges had the responsibility either to send the murderer’s corpses to the physicians or hang the bodies in chains along public roads as a message to other would-be offenders. In no case would a murderer’s body be buried. Even in death, the state would punish the body of the condemned. In effect, the law recognized both the socio-cultural importance of burial and the strong sentiment against postmortems. Dissection was a punishment fit only for the most debased. Adding to the public distaste for dissection was the fact that the process was not the relatively quiet, scientific affair it has become in the modern era. After the bodies of the condemned were taken from the gallows -- in at least a few instances, pried from the hands a riotous crowd, family members, and henchmen -- they soon became public curiosities. People paid for access to the anatomy theater. In one instance in 1776, a smuggler, who had murdered someone in the course of his work, had his body flayed and cast in wax in the pose of a classical sculpture. Another in 1801 found himself flayed and crucified so that artists could study his musculature and compare it to representations of the dying Christ by the Renaissance Masters. To make the whole business even more sordid was the fact that there were too few criminals’ bodies to be had. Physicians and their students needed a steady supply. They turned, therefore, to the black market. They connived with criminals -- became criminals themselves -- to get the coveted bodies they needed. The most reliable places to find fresh bodies were the graveyards, so they had their students do the dirty business of disinterring newly buried corpses. One student of Macartney, Dominick Corrigan, recounted how they bribed watchmen and formed violent gangs of body snatchers -- or, “resurrection men” as they were sometimes called -- who warred against each other in the night. In response, families posted watch at the graves of the deceased, hoping to prevent their loved ones from ignominious fate of the doctors’ scalpel. A few of these resurrection men even murdered people in order to sell cadavers to ostensibly unwitting physicians. Consequently, several highly visible trials in the 1830s led to an outcry for legal ways for physicians to obtain bodies. Barré’s act went beyond simple humanitarianism. For her, it was a feminist statement. She wanted to be an example to other women for whom conventional modesty stood in the way of science and equality. To many French Revolutionary feminists, this equality meant not only having equal access to rights, but equal responsibility to protect them and improve the lives of their fellow citizens -- even if this meant having her body dissected and displayed. Such marks in pleasures and in pains endure. If pains must come, let them extend to few. Between 1828 and 1832, Bentham, Southwood-Smith, and others lobbied Parliament to pass legislation on the matter, calling for votes during times when few people would be there to debate -- as late as 1am. The bill they helped to write had two key points. First, it decriminalized dissection. Secondly, it changed the mechanisms by which physicians could acquire corpses. It would allow physicians to get bodies from any party in “lawful possession” of the deceased, unless there were objections from family members or a personal testimony that could be confirmed by two witnesses. let them act under a measure which dispenses equal justice to all -- the rich as well as the poor -- the fat sinecurist as well as the worn-our labourer, and then, when they are dealt equally with, they might talk as much as they pleased about the necessities of science. It is better to be a human being dissatisfied than a pig satisfied; better to be Socrates dissatisfied than a fool satisfied. And if the fool, or the pig, are of a different opinion, it is because they only know their own side of the question. Other students took his philosophy and merged it with socialism, feminism, and anti-slavery. Prominent among these was Fanny Wright (continued in Part 2). Southwood-Smith to William Munk, 14 June 1857 transcribed in C.F.A. Marmoy, "The "Auto-icon" of Jeremy Bentham at University College, London," in Jeremy Bentham: Critical Assessments, vol. 1, ed. Bhikhu Parekh(London: Routledge, 1993), 102-3. This must be the Mary Josephine Barré, who published Elementary and Analytical Grammar, for the use of those persons who wish to leaner French (Dublin, 1809). According to Macartney, she published an untraced epistolary memoir in 1822. London Medical Gazette: or, Journal of Practical medicine 10 (1832): 586-7. "Dublin University," The Dublin Penny Journal 4, no. 1 (10 October 1835): 115. J. Collins Warren, "A Souvenir of the Macartney Museum," Contributions to Medical and Biological Research, vol. 2 (New York: Paul Hoeber, 1919), 807. Catalogue of the Osteological Portion of Specimens Contained in the Anatomical Museum of the University of Cambridge (Cambridge University Press, 1862), 111. Dominick Corrigan, “Reminiscences of a Medical Student,” Donahoe’s Magazine 1, no. 5 (May 1879): 394-95. Jeremy Bentham, “Logical Arrangements, or Instruments of Invention and Discovery,” The Works of Jeremy Bentham, part 9, ed. John Bowring (Edinburgh, 1839), 287. Thomas Southwood-Smith, Use of the Dead to the Living (London, 1828), 31. Ruth Richardson, Death, Dissection, and the Destitute, 2nd ed. (Chicago and London: University of Chicago Press, 2000), 199. Richardson, Death, Dissection, and the Destitute, 230. John Stuart Mill, Utilitarianism (London, 1863),14.